Nendoroid Mikasa Ackerman from the popular anime series Shingeki no Kyojin (Attack on Titan) is one of the Nendoroid who got more spotlight on the recent Summer WonFes. The prolific Titan hunter is now available for pre-order. From the anime series ‘Attack on Titan’ comes a Nendoroid of Mikasa Ackerman! She comes with three expressions including her standard expression, a shouting expression and a stunned expression. The Nendoroid also includes her Vertical Maneuvering Equipment and dual blades, as well as effect parts to display her soaring through the air with the equipment. You can even pose her as if she were striking down into a Titan’s neck by making use of the included blood effect parts which attach to her blades. The scarf that Eren gave her is also included to create even more scenes from the series. Nendoroid Mikasa Ackerman is scheduled for January 2014 release with a price tag of 4000 Yen that will includes 3 expressions, a couple of accessories as well as a few effect parts. 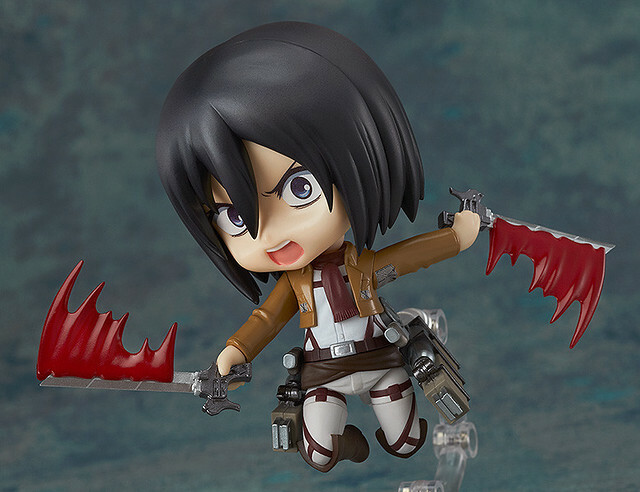 If you pre-order her at Good Smile Online Shop, a special Nendoroid Stand: Mikasa Ackerman version will also be included. As usual, you can see this Nendoroid up close on Kahotan’s preview post. 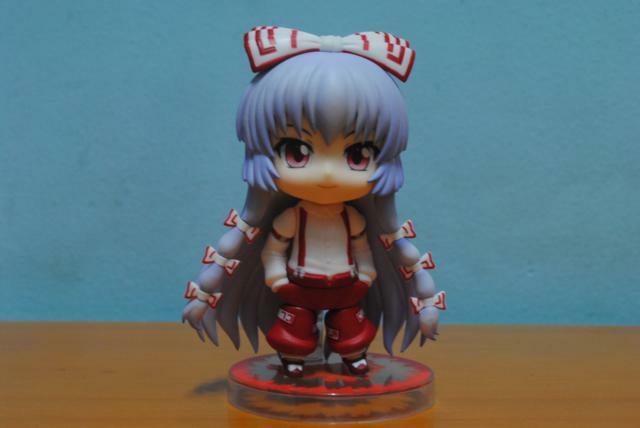 So you have been waiting for Nendoroid Mizuki Nana? Missed your chance to get her on the Mizuki Nana Live Circus 2013? Well, now is the perfect chance to get her as she is available for pre-order starting today. The NANA PARTY action figure! The singer and voice actress, Nana Mizuki is joining the Nendoroid series! She is posed in the waitress outfit seen in her ‘Lovely Fruit’ music video, and also comes with a hamburger on a tray to complete the pose! A Nendoroid-sized version of her mascot character ‘Nanet-san’, a live T-shirt and microphone are also all included to help you recreate her live stage performance! As you might have known, she is priced at 4900 Yen and scheduled for January 2014. Orders can be placed on Good Smile Online Shop between the August 22 from 12:00JST until September 6th (Fri) at 18:00JST. Well well … what a surprise we have today yesterday – Nendoroid Saber Alter: Super Movable Edition was announced by Kahotan, and today we have her available for pre-order as well! The King of Knights, corrupted by a dark shadow. 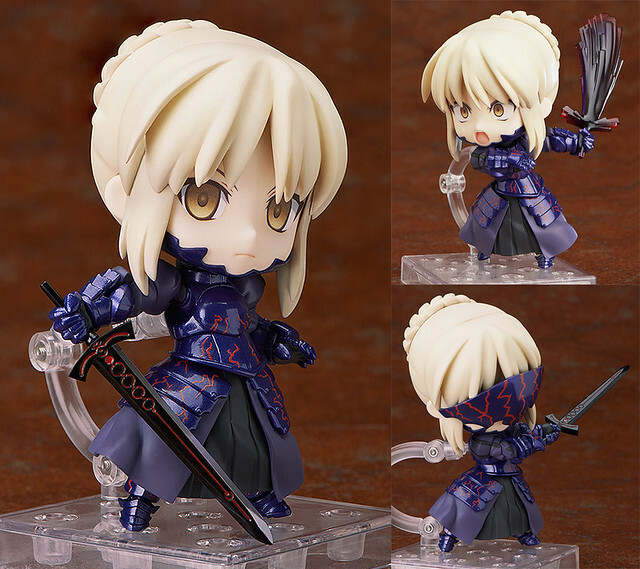 From the popular PC game ‘Fate/stay Night’ comes a Nendoroid of the ominous Saber Alter! She comes with two expressions including her standard expressionless face as well as a shouting expression! Her mask is also included and can be attached and removed whenever you like! Also included as optional parts are two swords – her holy sword Excalibur dyed a dark black, as well as the sword erupting with dark energy, Vortigern – posing her with either sword together with the shouting face allows you to recreate various combat scenes from the series! Nendoroid Petite Kanon from the popular PSP game Photo Kano was released over a year ago, and now the remaining characters are being made into a Petite set – Nendoroid Petite: Photo Kano. Get ready to take more photos of the girls… this time as Nendoroid Petites! From the game that became a popular anime series ‘Photo Kano’ comes a set of Nendoroid Petites of the girls that become models for the main character’s photos! 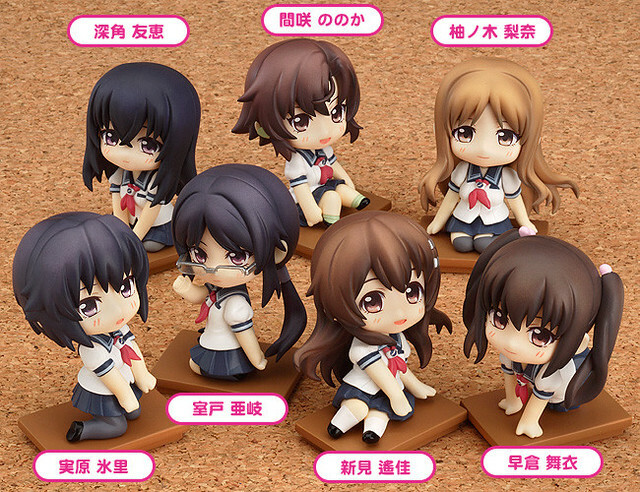 The set includes seven different characters including Haruka Niimi, Aki Muroto, Mai Sakura, Hikari Sanehara, Nonoka Masaki, Rina Yunoki and Tomoe Misumi! They are all sculpted in the lovely poses from the anime’s key visual, each sitting atop a desk while posing for the camera! There is also one secret character, meaning if you want to get a photo of them altogether you’ll need to collect all eight! 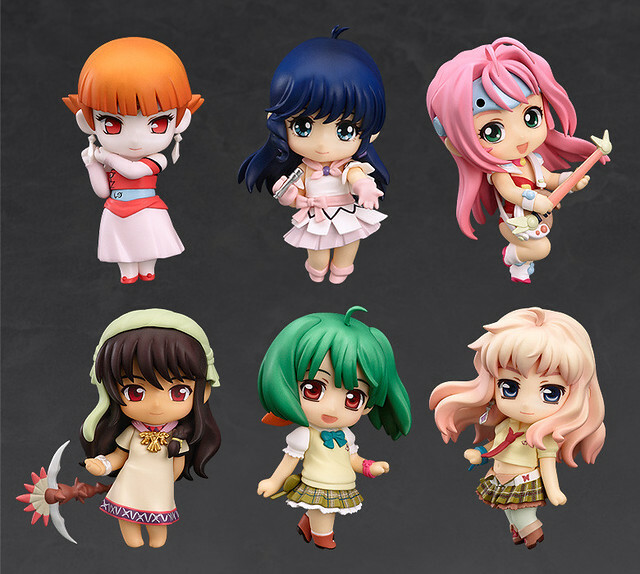 As usual, each Petite will be priced at 600 Yen, and you can pre-order them in a box of 8 Petites including one Petite of a secret character. This set is slated for December release. 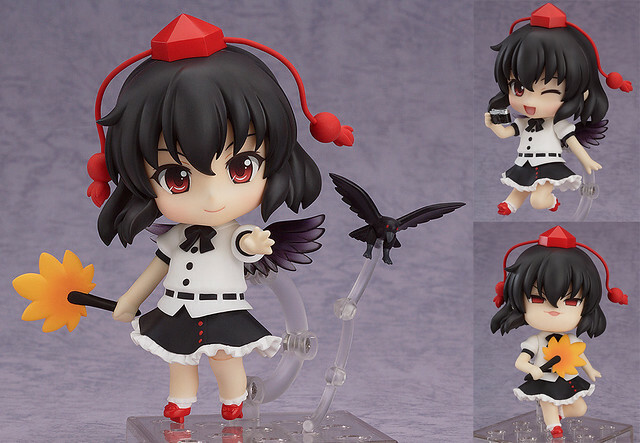 Ah … it’s about time we see another Nendoroid from Touhou Project, eh? 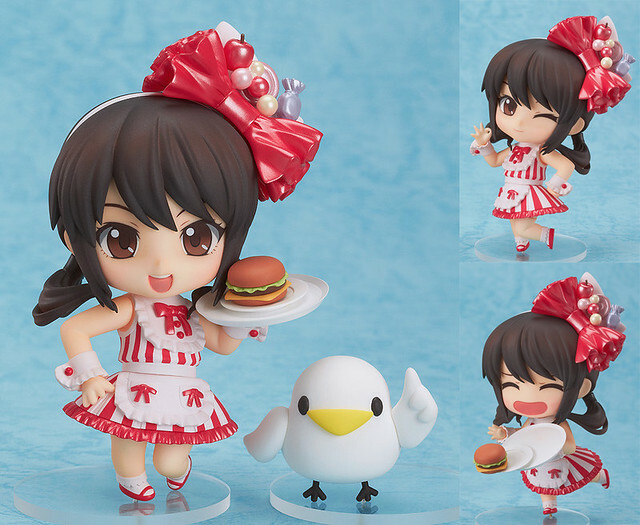 Yep, Nendoroid Shameimaru Aya is finally announced officially and available for pre-order at several exclusive stores. The Tengu reporter always rushing around Gensokyo! From the popular game series by Team Shanghai Alice, the ‘Touhou Project’ comes a Nendoroid of Gensokyo’s resident Tengu reporter, Aya Shameimaru! She comes with three different expressions including a standard expression, a smiling expression and even the popular ‘Take it easy!’ expression! Optional parts include her leaf fan and a tornado part which allow you to pose her manipulating the wind! She also comes with a crow and various tools to help her report an anything she comes across, including her camera, pen and notepad! Enjoy posing her in all sorts of situations! Nendoroid Shameimaru Aya is priced at 3500 Yen and scheduled for December release. Kindly visit Kahotan’s blog for a bit more info as well as close-up shots.